**Hit "REGISTER NOW" to purchase event ticket and/or drink cup!!! 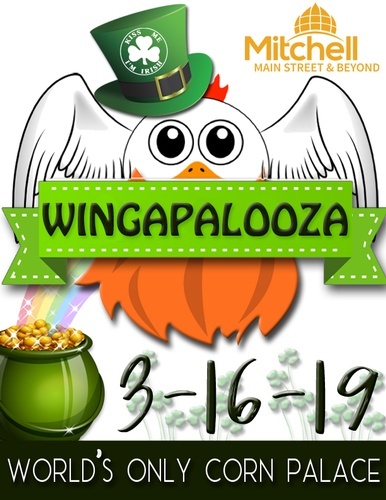 Wingapalooza, is an event fundraiser hosted by Mitchell Main Street & Beyond. Again this year, keeping in the spirit of St. Patrick’s Day and March Madness, there will be green beer, as well as TVs set up to watch the 2019 NCAA post season basketball. Proceeds for the event go towards supporting Mitchell Main Street & Beyond, a nonprofit organization that began in 2007 with the mission to maximize the economic potential and to preserve the heritage of Mitchell’s historic Downtown district.